I’ve got a cool little utility that may or may not solve a problem for you. Typeeto from mac.eltima.com/… lets you use a Mac as a Bluetooth keyboard for your iOS devices, including the AppleTV. Before I walk you through it, let’s set up a couple of problems it might solve. The AppleTV is the most obvious problem – typing (even with the new remote) is a nightmare. If you have voice recognition in your country for the Apple remote, that actually works surprisingly well, especially for passwords. But most of the time we end up scrolling right/left/up/down and doing a lot of swearing when we try to type on the AppleTV. Using a Bluetooth keyboard with the AppleTV can make you happier, and if you’re watching TV with a laptop right near you, why not use its keyboard instead of that aggravating remote? If you have a MacBook or MacBook Pro, I bet there are times where you wish you had a little more screen real estate. This is especially true if you’re on travel where it’s impractical to carry a second monitor around with you. One solution is to split tasks between your Mac and your iOS device. Maybe do your web surfing on the Mac and read and write email on an iPad. But typing on the iPad is a pain without a real keyboard. What if you could just use a keystroke on your Mac to allow you to type on the iPad and then flip back to typing on the Mac? That would be pretty cool. You could use one of those apps that allows you to use your iOS display as a secondary monitor, like the awesome Duet Display from duetdisplay.com to solve the same problem. Duet works really well and if you’re going to be working for a long time on a desk it’s a great solution. I fired it up to remind myself how to use it. First I had to wire the two devices together. I wrestled my lightning cable out from its entanglement with my headphones and Apple Pencil in my bag, then I had to wrestle loose my USB-C to USB adapter for the MacBook. The two connected easily through the menubar app, but once they were connected I had to open up Displays Preferences to set the arrangement of the windows so that I could move windows back and forth between displays. Nothing against Duet at all if you’re going to use it for a while at a stretch, but it’s not a quick process to set up. It’s also $20. You could also drag a Bluetooth keyboard around with you and use the Mac keyboard to talk to the Mac and the second keyboard to talk to the iOS device. Or you could get one of those keyboards that talks to more than one device with a physical switch to go back and forth, but now you’re carrying three things around instead of two. As a road warrior you really want to reduce weight and simplify things, not add complexity. I think we’ve got a couple of scenarios here that might help people out, so let’s look at Typeeto. Typeeto is free in the Mac App Store and requires nothing to be installed on the iOS side. When you launch Typeeto, it installs as a menubar app. The one-time setup process goes like this. Open Bluetooth Settings on both the Mac and the iOS device you want to control. The two devices should be able to see each other. On the Mac side, tap the Pair button next to the iOS device. You’ll get a code on screen on the Mac and on the iOS device. Simply confirm that they’re the same on the iOS side and you’re done. In just a second or two you’ll see a little floating window with the name of your iOS device that says “start typing”. That was pretty minimal work, and it’s only required the first time you pair your devices. Open preferences on Typeeto and you can set up a quick launch keystroke for each of your iOS devices to toggle back and forth between typing on your Mac and typing on the iOS device. It’s positively magical! 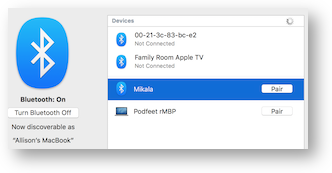 With the AppleTV it’s even easier, simply go into Bluetooth settings and select your Mac and you’re done. No code to set it up. In Settings on Typeeto there are a couple other options, like whether or not to have sound effects, whether to show it in the Dock and even how to use a keystroke to paste text from the Mac into the other device. Typeeto is too polite to assume you want it launched at login (unlike some rude apps I could name) so if you like Typeeto and want it always available at your fingertips, you’ll want to check the box for start at login in the Preferences too. I’m going to keep Typeeto on my Macs if only for typing on the AppleTV. Remember, it’s free, and there’s a link in the shownotes to Typeeto in the Mac App Store, go check it out. You can also go to mac.eltima.com/… and check out their other Mac and Windows tools including a media player, a youtube downloader, a bulk image editor and more.